The environment means everything to her. No more sculpting just for the sake of beauty. American sculptor Cornelia Kavanagh 'works with water'. So concerned with environmental disasters that happened in the course of the past decade, and that are still happening, she felt she could not continue creating sculpture celebrating beauty alone. The devastating power of the tsunami in 2004 was, as she describes it, "a defining moment in my career". From that moment on she carved tsunami sculptures. And then, whilst sculpting tsunami waves, she became intrigued by the melting of the polar ice and the deterioration of the ecosystems at the edges of glaciers where fresh meltwater drains into the Arctic sea. Suddenly, from one day to the next, the environment had 'captured' her. 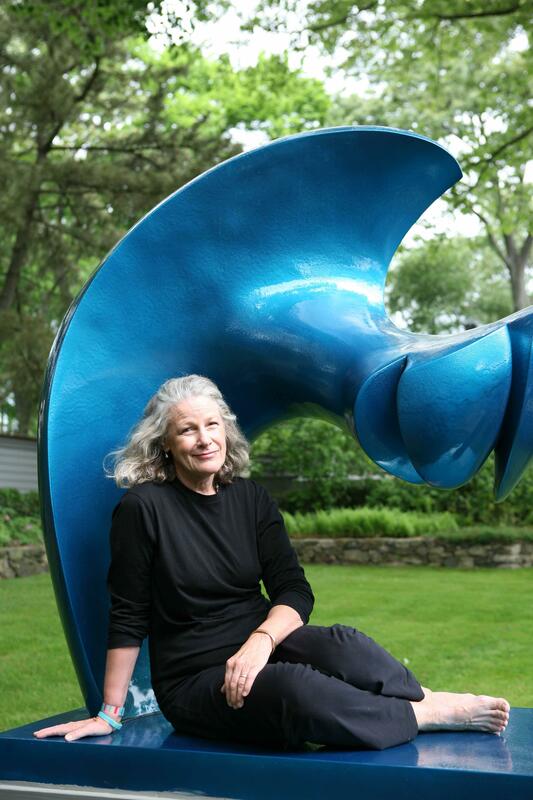 "I took my hands seriously rather late"
American sculptor Cornelia Kubler Kavanagh (73) is a daughter of George Kubler, one of the most influential art historians of the twentieth century. Cornelia Kavanagh lives and works in Norwalk (Connecticut, USA) and in the US Virgin Islands. She grew up in an artistic environment rich in the visual arts. Her mother founded The Long Wharf theatre in New Haven, Connecticut, where her father was a Professor at Yale University. Cornelia played the piano as a child, and while she always felt she belonged in the arts, she had a career teaching history and English in high school before "taking her hands seriously" rather late in life. Although she had started dabbling in ceramics in her mid 30s, after carefully studying the art works of the world's great masters of pottery, she knew she could never become as good as they were. She explains: "I didn't find ceramics satisfying anymore. 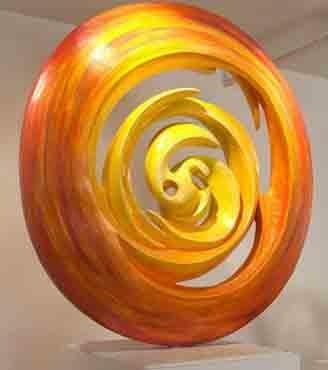 Besides, I wanted to explore abstraction, so I started making abstract sculpture. Still it took me basically 10 years from that moment to become a good sculptor." The inventive Cornelia Kavanagh is a self-taught artist, who became a full-time sculptor, after a long career in teaching and raising her children. Finally giving in to her life-long passion for translating form into sculpture, she began her artistic career at 46. "The real world lives inside"
"I never took one lesson in sculpture," she says. "I learned a lot by myself, by reading books, by simple observation, and with the help of my husband, contractors and roofers, who gave me technical advice while working on my house. I have spoken with other sculptors, too, but the real world lives inside. Real inspiration comes from the imaginary forms I need to express. It has been a very interesting journey from knowing nothing to becoming proficient in technical skills." For casting her sculptures in bronze, aluminium and stainless steel, Cornelia works with three foundries: Polich Tallix in Rock Tavern (New York), A.R.T. Research Enterprise in Lancaster (Pennsylvania) and Walla Walla Foundry (Washington). "Sculpture must reveal nature, not copy nature"
Cornelia Kavanagh taught herself to carve stone in the tradition of Moore, Hepworth, Arp and Brancusi. 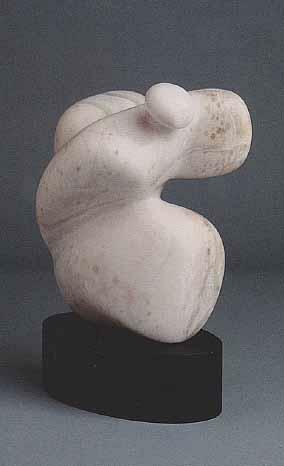 Influenced by both the work and thoughts of Henry Moore, Kavanagh says: "It was Moore who stipulated that a sculptor must be obsessed with the intrinsic emotional significance of shapes, that sculpture must be expressive yet still, reflective yet physical, monumental yet meditative, reveal nature not copy nature, and more than beautiful, it must be timeless." The early works of Cornelia Kavanagh consisted of stone carvings, like the alabaster Angel (photo left). After her first exhibition in New York (1996), she started replicating her stone sculptures in limited edition bronze castings. Most of her early sculpture was carved from either Carrara marble, steatite (the only soapstone that can be used in exterior installations), or a variety of alabasters. 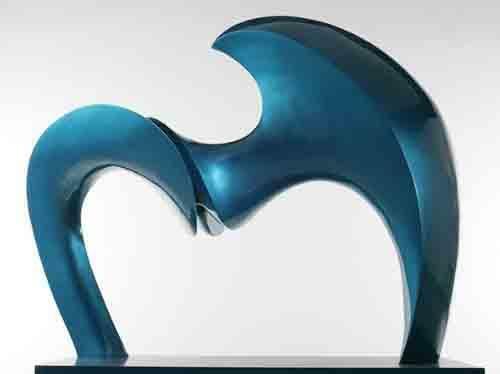 Recently, focusing on environmental projects cast in bronze, aluminium, and stainless steel, Cornelia Kavanagh has moved away from the early influences of the great masters and developed a style of her own characterized by rounded, sensual shapes. For her tsunami project she carved a number of her art works in polystyrene foam, and then covered them with plaser before painting. 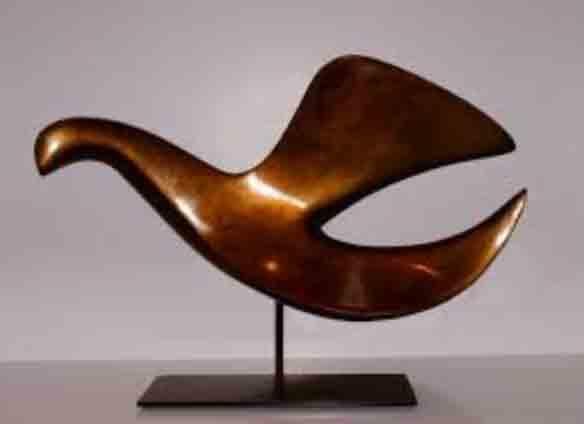 An Interesting work of art is Bird Form III cast in bronze (2003, photo right), part a trio of birds that she made in response to seeing images 9/11 of the destruction of the Twin Towers in New York City in 2001. In total almost 3,000 people died in the terrorist attacks on that fateful day. The three birds represent a family flying away to safety. The Tsunami disaster on 26 December 2004 in Banda Aceh in Indonesia caused a revolution in the work of Cornelia Kavanagh. Almost instinctively she decided to carve large-scale sculptures based on tsunami waves. She was actually preparing work for the 51st Venice Biennale in 2005, where she would represent the United States Virgin Islands Council on the Arts with five 'Shape of Time' sculptures, honouring her father's seminal treatise on art history, The Shape of Time (Yale University Press, 1961). But her work was dramatically interrupted. Remembering the moment when she first saw news coverage of the tsunami, Cornelia couldn't believe her eyes. "I was working in my studio on a model, I went inside to make lunch, and saw this devastation in Indonesia on television." "An enormous wave just grew out of the sea and swallowed an entire beach community. I couldn't move, I couldn't eat. I simply started to cry." As a response to this catastrophe, Cornelia's work took a serious change of direction. She would no longer serve beauty without trying to convey a deeper message. Confronting the senseless devastation of the tsunami, she wanted to attempt to reconcile "water's inherent fluid grace with its horrific capacity for destruction." Adding to the profound sense of grief she felt for all those who had lost their lives, she learned after starting her tsunami project, that a friend of hers, Fernando Bengoechea, a photographer who had taken pictures of her work, had become one of the tsunami victims. Cornelia had called him a month or so before the tsunami swept over the beach of Banda Aceh. And then, some time later, she learned, he had died in that very tsunami. Cornelia: "I didn't know that for a long time, but suddenly I realized why I was doing the carving of the tsunami's. It was to honour his life." Her tsunami exhibition took place in September 2006 at the Blue Mountain Gallery in New York City. In total she made ten sculptures of tsunami waves, all of which were carved from foam and covered with painted plaster for commissioned castings in bronze, aluminium and stainless steel. Following the tsunami project, Cornelia Kavanagh became a kind of 'environmental ambassador' and appeared to be unstoppable. She hopes that her works of art will raise consciousness about the health of our oceans, the melting of the polar cap, and consequently, the health of our planet. Concern about the melting of the arctic ice encouraged her to consult with scientists (glaciologists), about 'ice moulins', the tubular chutes through which glacial melt water cascades into the sea. Her exhibition 'Arctic Ice Melt: moulins of my mind', was previewed during the International Polar Weekend at the American Museum of Natural History in February, 2009, and later exhibited at the Blue Mountain Gallery in New York. Two of Kavanagh's Moulin sculptures were subsequentially installed at the Peabody Essex Museum in Salem, Massachusetts, in a year-long exhibition called 'Ripple Effect: The Art of Water'. 'Arctic Ice Melt: moulins of my mind', was Kavanagh's emotional response to the warming of the polar ice cap. The Arctic is warming faster than any place on earth. Pieces of glaciers tumble into the sea and meltwater surges downward through holes in the ice, called moulins. "For my project about the melting of the polar ice in Greenland, I worked with a world-famous glaciologist who has lived for 17 summers on Jakobshavn Isbrae, a large outlet glacier on Greenland, studying the rate of flow and the melt of the arctic ice." "The importance of working with scientists"
Cornelia Kavanagh wants to share her environmental concerns wherever she can. She explains: "Although people were starting to pay attention to carbon dioxide emission years ago, and governments were starting to talk about how to change energy consumption, it seemed that few people really wanted to know about climate change. I realized that my work might best combine with the findings of scientists to carry out distinctly different messages about our similar concerns to wider audiences. So I work together with scientists all over the world." 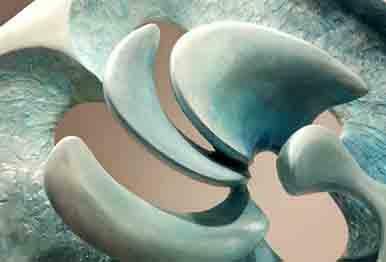 Currently, Kavanagh is exhibiting five sculptures of pteropods (sea snails), at the Smithsonian's National Museum of Natural History in Washington, DC, to draw attention to the dangers of rising levels of ocean acidification caused by CO2 emissions. Her exihibtion is called: "Fragile Beauty: The Art & Science of Sea Butterflies."